Here is another appetizer that could be eaten as a main dish. Elk or Venison are a wonderful alternative to Beef. They are a much leaner source of protein and have a greater protein-to-fat ratio compared to boneless-skinless chicken breasts. You can find Elk or Venison at specialty butcher shops – I get mine from The Healthy Butcher. Combine all ingredients in a saucepan. Stir together well. Bring it to a simmer and let it sit for 20-30 minutes. Stirring occasionally. In a large bowl, mix together all ingredients (except olive oil). Mixing by hand works best. Use a Tbsp to scoop out meat and roll into a meatball. Repeat. Place them in the pan. Cook for about 3-4 minutes. 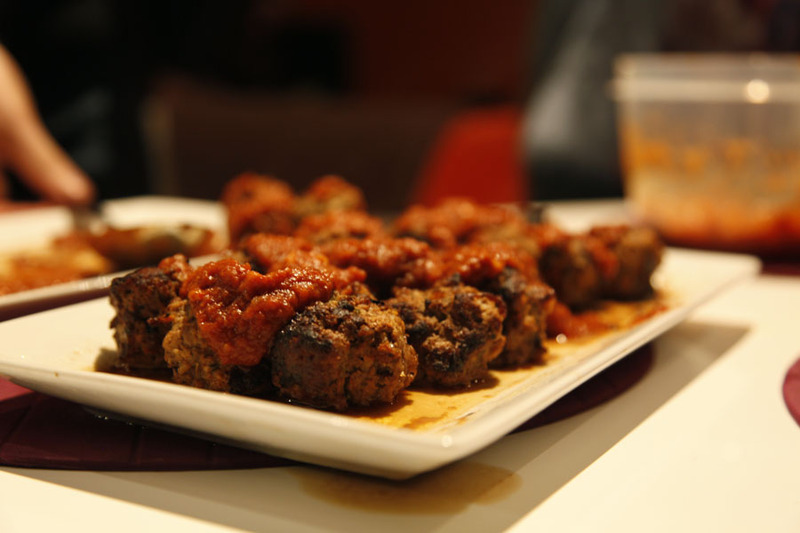 Gentley (I repeat…GENTLEY – these guys are fragile) flip the meatballs to cook the other sides. In total, they take about 8 minutes to cook around (depending on their size). You can get a feeling for when they are done cooking by pressing down on them to see if they’ve firmed up. If you’re doing multiple batches, add more olive oil to the pan in between batches. Pour some of the Sauce on top of the meatballs and serve. I just made them for a ski trip on Monday and had a couple for dinner with spinach! They are scrumptious!